The South Korean chain already has five shops in Queens. 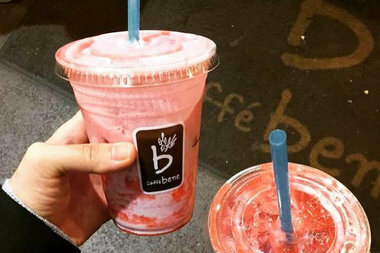 JACKSON HEIGHTS — Caffebene, a South Korean coffee chain, will open a location on 81st Street and 37th Avenue, according to the company. The coffeehouse — known for its lattes specifically the "Misugaru" — which is described as a type of protein-packed liquid meal made out of black sesame, black rice, brown rice, black beans and other ingredients. The chain will open in the site formerly occupied by the Prima Donna clothing shop sometime in the fall, according to the company's marketing associate Amy Park. Park said it will be the sixth Caffebene shop in Queens, and one of 1,600 across the globe. In March, the company announced plans for a Kew Gardens location with indoor and outdoor seating. The company opened in Seoul in 2008 and is the most popular coffee chain in South Korea, selling baked goods and other sweets in addition to hot and cold coffee drinks.